Playing And Arranging Reels, Jigs And Airs For Fingerstyle Guitar. Composed by Doug Young. Saddle-stitched, DADGAD and other Open Tunings. Study Books & Method Supplements. Book/CD Set. Published by Mel Bay Publications, Inc (MB.30485BCD). ISBN 9780786685981. 11.75 x 8.75 inches. Fiddle Tunes in DADGAD shows how fingerstyle guitarists can use DADGAD tuning to play traditional tunes, including twenty-four complete arrangements of common American, Irish and Scottish ballads, airs, jigs and reels. The book explores techniques and patterns for playing melodies across the strings, producing a harp-like effect that adds a distinctive and beautiful character to traditional melodies. In addition to building repertoire, the material demonstrates ways to arrange your own melodies or even write your own tunes based on the techniques provided. 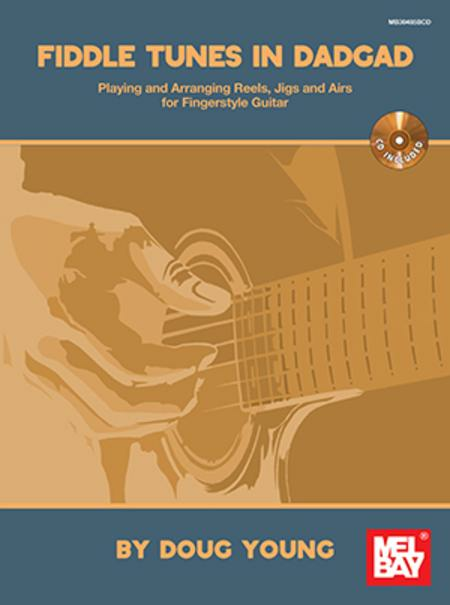 This is a perfect follow-up for guitarists who have studied Understanding DADGAD for Fingerstyle Guitar and are looking for tunes to learn, or for those who want to go deeper into harp-style playing. It is also an excellent introduction for those who prefer to just dive head-first into DADGAD by learning some classic tunes.